ARQ 531 potently inhibited BTK (IC50 = 0.85 nM), the binding potency was accompanied by long residence time (51 min). ARQ 531 selectively inhibits BCR signaling dependent PI3K/AKT/mTOR, Ras/Raf/Erk and Rap-GTPase-Cofilin pathways in TMD8 cells. It potently inhibits proliferation of hematological malignant cell lines both sensitive and resistant to ibrutinib addicted to BCR signaling. 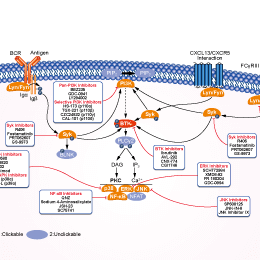 Unlike ibrutinib, ARQ 531 suppressed both the upstream activating signals (via inhibition of a select member of Src kinase family) and the downstream signaling pathways (via pAKT and pERK kinases). In GCB-DLBCL cell lines (SUDHL-4 and DOHH-2), ARQ 531 potently suppressed expression of anti-apoptotic c-Myc and BCL6 oncoproteins in a dose dependent fashion, and concomitantly induced apoptotic cleavage of PARP protein. ARQ 531 has potent anti-tumor activity was observed in both ABC-DLBCL and GCB-DLBCL mouse xenograft models. ARQ 531 crosses the blood, brain-barrier. In a single oral dose study of 10mg/kg in monkeys, the bioavailability of ARQ 531 is 72.4% with a Cmax of 9 μM and a half-life greater than 24 hours. Sudharshan Eathiraj, et al. EHA Congress. 2017, ePoster number: E1400. Sudharshan Eathiraj, et al. AACR Cancer Res 2018. 78(13 Suppl):Abstract nr 1963. Sean D. Reiff, et al. Blood. 2016, 128:3232.